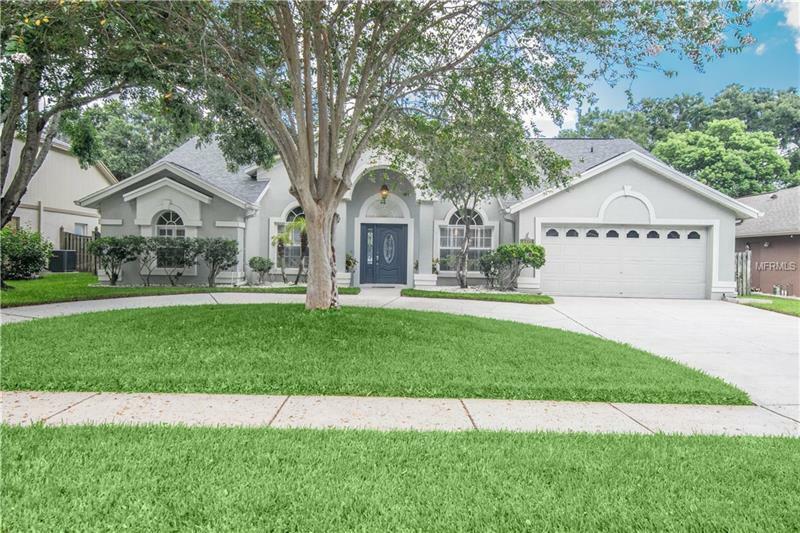 Located in the heart of Carrollwood this 4 bed, 3 bath, 2-Car garage home in desirable Carrollwood Village. A covered entryway welcomes you home and into the beautifully tiled foyer and the expansive Living/Dining room. Continuing the tiled pathway is a beautiful kitchen with Granite counter tops, double oven, maple cabinets, tiled back splash with exceptional storage. Attached is a utility room with ample space for your washer and dryer, and a deep sink. The home also features a Tankless hot water heater. The Kitchen overlooks the light filled family room, with wood burning fireplace and has easy access to the lanai to enjoy the sparkling pool. The 3 generously sized guest rooms all have wood flooring. The charming private Master, with easy access to the large porch to enjoy sunsets every night, boasts a beautiful separate shower, garden tub and a dual sink vanity. You will NOT be disappointed, schedule your showing now!